Boston gets a laid-back Japanese Tavern, Wolfgang Puck debuts a new restaurant in Michigan and more. 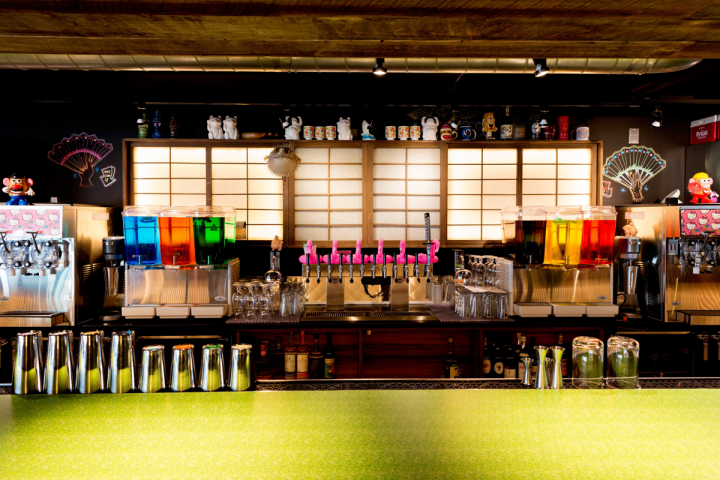 Located in the music-inspired The Verb Hotel in Boston’s Fenway neighborhood, Hojoko is a relaxed Japanese tavern with an impressive beverage selection. The venue opened in August, boasting an upbeat interior with graffiti and video games, Godzilla memorabilia, and large screens showing sumo wrestling matches and anime. The food menu represents several categories, including sushi, robata, ramen and teppanyaki. Operated by celebrated chef Tim Cushman and his wife, Nancy, the eatery serves everything from a spicy tuna roll to robata-grilled chicken thigh to crispy fried calf brains (sushi rolls start at $5; larger entrées are $7 to $28). The beverage program highlights nearly 20 sakes by the glass ($6 to $18) and several by the bottle ($100 to $188), along with Japanese whiskies ($10 to $55 a 1½-ounce pour) and beers ($5 to $20 a draft pour or bottle). Specialty cocktails are available on tap by the shot ($7), glass ($12) or pitcher ($48), and frozen concoctions ($12) include the Japanese Caucasian, made with Reyka vodka, Allen’s coffee-flavored brandy, cold-brewed coffee and condensed milk. These offerings join signature drinks ($12 to $15) like the Kyoto, comprising Rittenhouse rye, Averna amaro, Fernet-Branca amaro, Demerara sugar and sansho pepper. 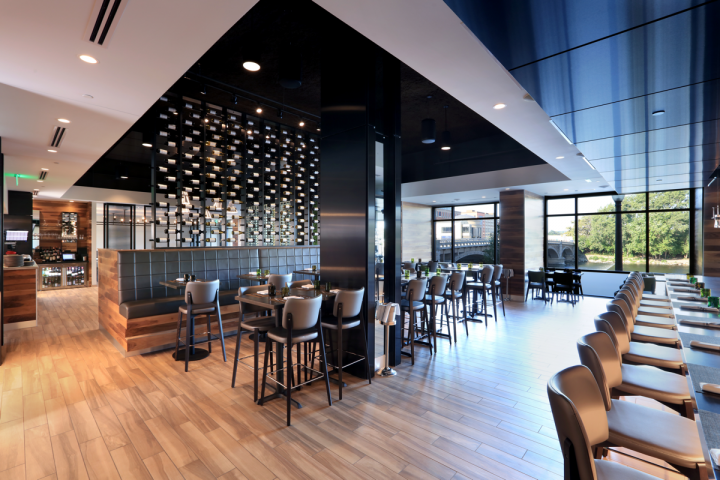 Wolfgang Puck has launched The Kitchen, a casual eatery in Grand Rapids, Michigan. Celebrity chef Wolfgang Puck debuted a new restaurant concept in September, opening The Kitchen inside the Amway Grand Plaza Hotel in Grand Rapids, Michigan. The casual eatery elevates global comfort food, preparing it with locally sourced ingredients. Dishes include tempura shrimp with spicy kimchee, Hong Kong–style steamed salmon, chicken alfredo, and roasted mushroom and truffled crème fraîche pizza (entrées are $13 to $39). The drinks program features classic cocktails ($9 to $12), a lengthy global wine list ($8 to $18 a glass; $32 to $340 a 750-ml. bottle) and nearly 30 beers, including many local craft labels on draft ($4 to $9 a draft pour or bottle). Boasting a large outdoor patio along the Grand River, the venue is located next to Puck’s new quick-service breakfast and lunch venue, The Kitchen Counter. Mexican cuisine meets French cooking techniques at Madrina, which debuted in Dallas in September. Operated by Misery Loves Co., the restaurant features an elevated food menu and a varied drinks list that offers agave-based spirits, eaux de vie and French wines. Chef Alexander Alioto unveiled Nostra Spaghetteria and the adjoining Bar Mia in September in San Francisco’s Mission District. The Italian-themed eatery features a customizable pasta menu that allows guests to choose their noodles, sauce and toppings, while the drinks side emphasizes classic cocktails and amaro. Named for the year the Mexican Revolution began, Cantina 1910 opened in September in Chicago’s Andersonville neighborhood. The restaurant offers an updated approach to traditional and regional Mexican fare, from street food to ceviches and panuchos. Handcrafted cocktails are also available. The Southern-inspired eatery Succotash launched in suburban Washington, D.C., in September, serving such mainstays as fried chicken, burgers, bone-in rib eye and oysters, with sides like grits, roasted vegetables and skillet cornbread. The drinks menu includes Bourbon- and American whiskey–based cocktails.